Figure 1: Calle Ocho in 1977. This podcast episode will tell the story of Little Havana. Prior to the neighborhood taking a new name in the 1960s, it was known as two different neighborhoods. The Riverside neighborhood was located north of SW Eighth Street and was created by a lot of different developers during the first half of the Twentieth Century. The Shenandoah neighborhood developed south of SW Eighth Street and was named for its resemblance to the Shenandoah Valley in Virginia. Everything changed after Castro took over Cuba in 1959. Refugees migrated into Miami and ultimately settled into the area around the Tower Theater. Many of the institutions in the old neighborhood evolved with the changing demographics. 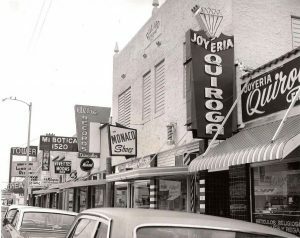 Beginning in the 1970s, many other Spanish speaking people from Central American began to migrate into Little Havana as well. Tune into this week’s podcast episode to hear more about Little Havana and its vibrant evolution into a Hispanic cultural center. Below are additional resources and articles that tell the story of this historic community. Cover: Tower Theater in 1951. Courtesy of Scott Stewart. Figure 1: Calle Ocho in 1977. Courtesy of Alvin Lederer.